Location: Seattle Center, 305 Harrison Street, Seattle, WA, USA, 98109. 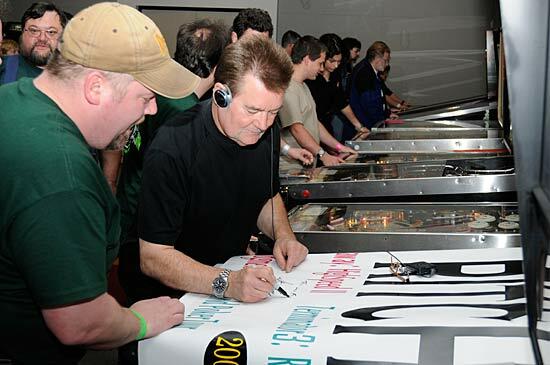 2008 marked a major step for Washington State’s annual pinball show. Previous events had been smaller and held outside of Seattle. 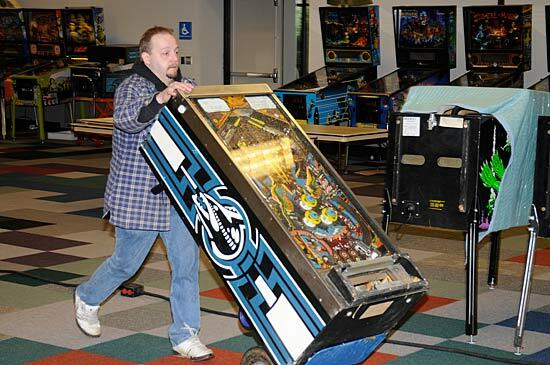 This year, local pinball collectors led by Bret Fritch of Puget Sound Amusements, decided to go big. 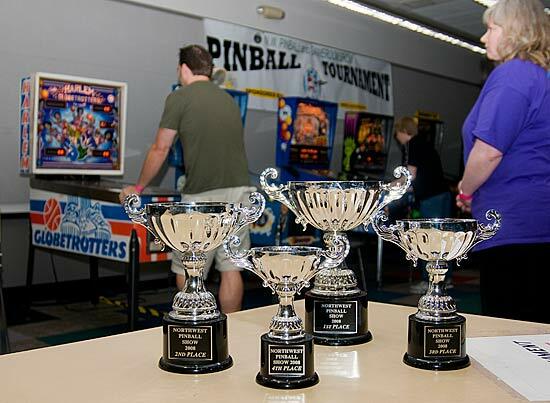 While a lot more planning, logistics, money, set-up, personal game collections, and volunteers were needed to pull it off, the local pinball community came together and made it happen. Showrooms at the Seattle Center were reserved, the event was well-promoted and advertised, guest speakers were booked, and all the effort really seemed to pay off when the weekend arrived. 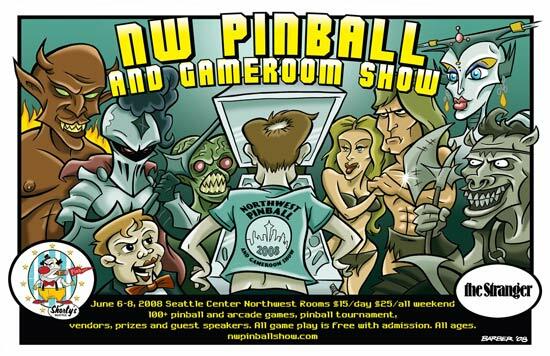 The 2008 Northwest Pinball and Gameroom Show turned out to be huge success, Seattle’s first big pinball event included 125 games on the main floor and nearly 1200 attendees, many of whom spent most of the weekend at the show! The doors opened at 4pm Friday, but local collectors had been working since 7am lugging games in the rain and preparing the hall. 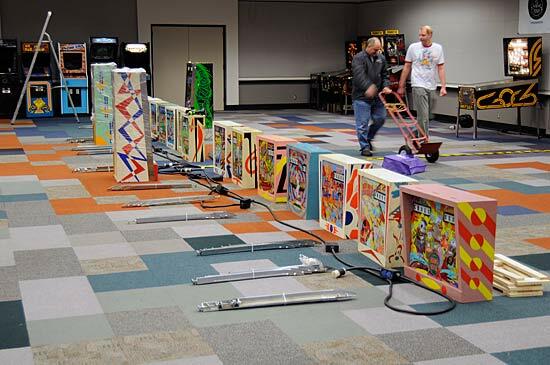 Approximately 110 pinball games spanning from the 1960s through today were on hand, along with a dozen or so classic arcade games and a handful of cool old EM arcade machines. 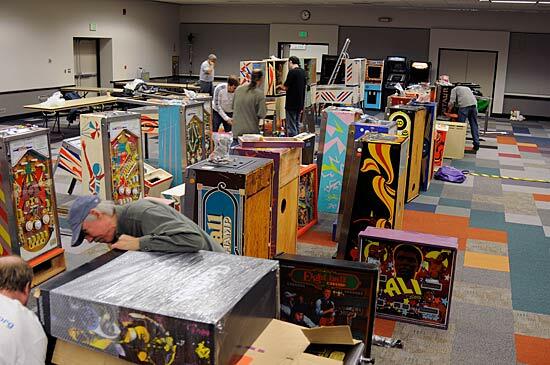 Many eras of pinball were well-represented, from a long line of old wedgeheads and piles of ‘70s and ‘80s games to many WPC titles and all the newest Sterns. Admission was $15 a day or $25 for a weekend pass for adults, with discounts for kids. A few vendors were on hand selling pinball parts, console games, and Silver Age, Silver Ball was selling a dozen neat EM pins that they set up for people to play. 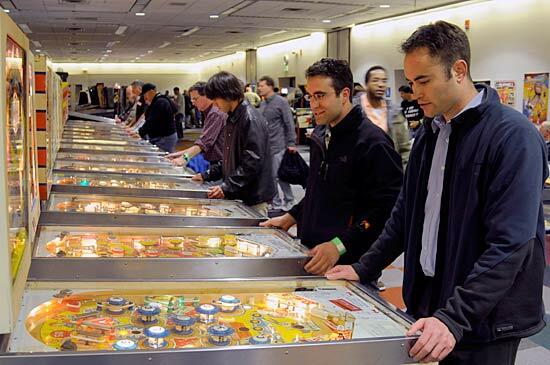 Next year a lot more vendors are expected to get involved now that the Northwest proved it could host a professional, successful and well-attended pinball show. 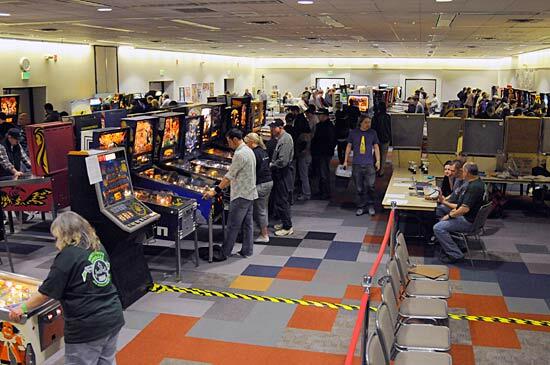 Friday evening was pretty busy, but by Saturday the main floor was packed solid with pinball players. Almost every game was in play, some with lines 2 or 3 people deep until the guest speakers started their talks. 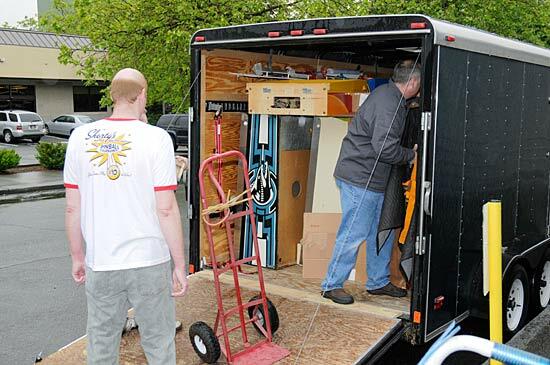 First up was Greg Dunlap, who was a Williams, Bally and Stern software designer that shared his stories and slides of behind the scenes action at America’s favorite pinball manufacturers. Next was Tim Meighan’s workshop, where he delved into the restoration of Electro Mechanical pins. Tim also brought some shining examples of his excellent work to the main floor and his games were a big hit! After Tim Meighan, sound designer David Thiel shared his experiences creating and composing the sounds for arcade and pinball games. 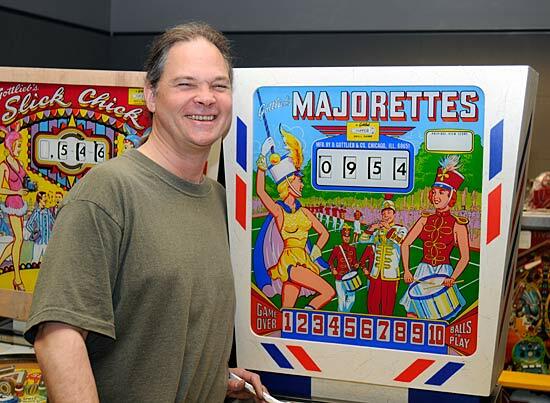 Most recently Thiel has composed the sound Stern pinball games like Pirates of the Caribbean and Spider-Man, but his talents can also be heard on video games like Q*bert and Reactor and pins like Monday Night Football and Laser War. In the movie Wiebe challenges the long standing Donkey Kong high score record held by Billy Mitchell. He finds himself up against Billy’s friends, Twin Galaxies (who maintains and regulates arcade game high scores), and some dubious videoed high scores from his competition. Throughout the movie Wiebe perseveres and fights on to get his high score recognized. His humble and humorous attitude really comes through in the film and even more so in person. 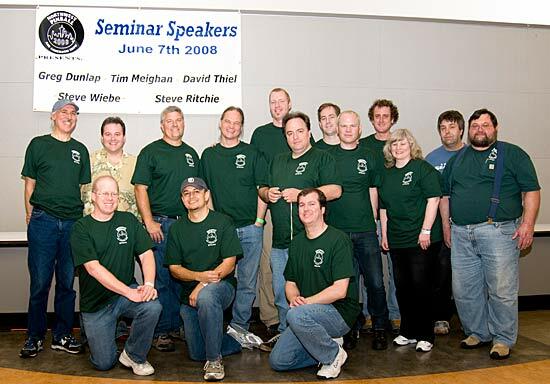 Wiebe seemed unable to talk badly about Mitchell or Twin Galaxies, even though the audience was on his side and practically begged him to during the Q&A session after his talk. He regaled us with the back story of his fight for the high score, his history playing Donkey Kong, things that we didn’t see in the movie, and what’s happened since the movie was released. Wiebe even played Donkey Kong on a projection screen and showed the crowd tips and hints. 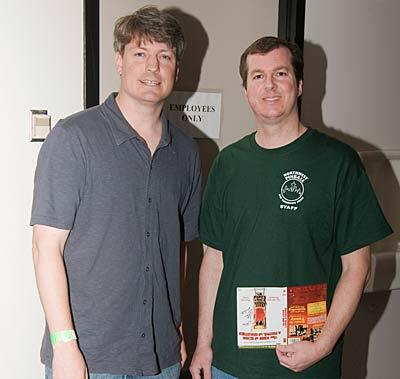 The keynote speaker was pinball and arcade game designer Steve Ritchie. In the ‘80s Ritchie brought us hit games like Black Knight, Firepower and High Speed, he followed up in the ‘90s with Terminator 2, Star Trek: The Next Generation and No Fear. More recently he has designed Stern’s Elvis, World Poker Tour, Terminator 3 and Spider-Man. 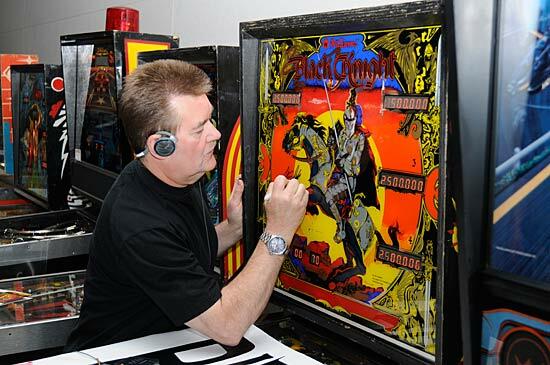 Ritchie was also the voice of Shao Kahn in the Mortal Kombat video game series and designed the popular arcade racing game California Speed. His presentation was a light-hearted slide show mostly consisting of photos inside the back rooms at Stern, including the designers and their messy offices. He also shared slides and stories from his personal life, like his love of for dirt bikes and his old Porsche, interspersed with stories about his history in the game industry. Ritchie was quite humorous throughout the presentation and Q&A that followed. When asked which game he’d most like to do a sequel of, he said Rollergames 2 to laughter and applause, later he confessed he’d love to do a third High Speed. Festival organizers managed to gather most of the Steve Ritchie designed pins and have them grouped together out on the main floor to play, which was great. Both Ritchie and Wiebe walked the main floor after their talks, graciously talking to fans and signing autographs. Each proved to be a real credit to their hobby, positively interacting with their fans and seeming somewhat taken aback that so many people were interested in them and their stories. 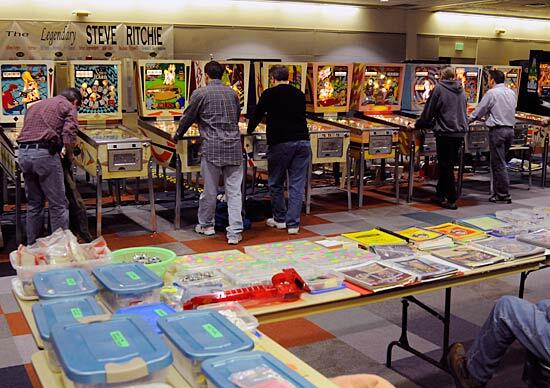 Meanwhile, back in the tournament area of the main floor, contestants were flipping, nudging and finessing their way towards achieving the highest scores possible on the tournament pinball machines. Friday and Saturday contestants tried to qualify for both the Novice and IFPA Tournaments. 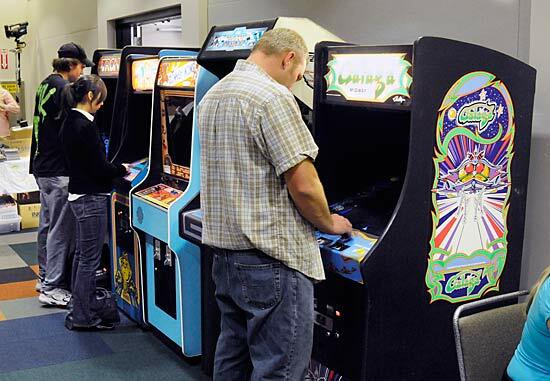 Players competed on Royal Flush, Harlem Globetrotters, Funhouse, Whirlwind, Creature from the Black Lagoon, Indiana Jones 4 and a black edition Spider-Man. The four finalists in the Novice Tournament were Jarrettt Gaddy, Brina Cady, Amilcar Cifuentes, and Garrett Dubofsky. 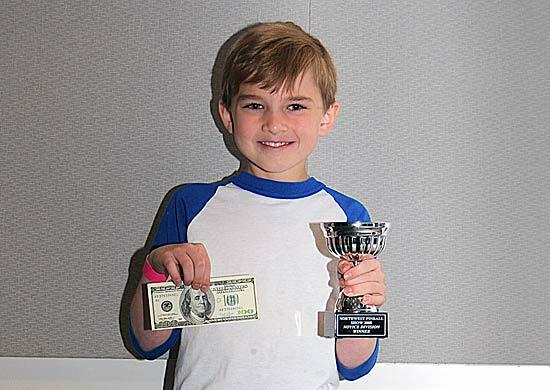 Garrett Dubofsky, at just 9 years old, took home the first place trophy and $100, while Amilcar Cifuentes took second place and $50. 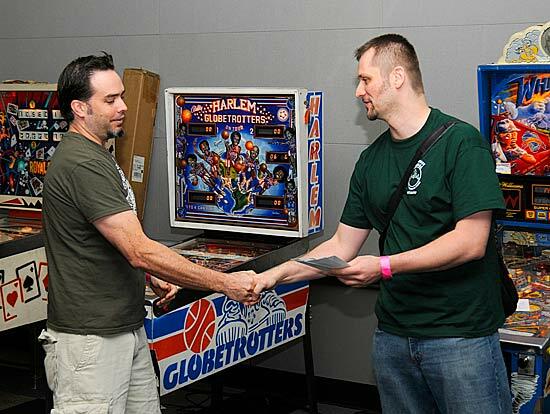 Several pinball machines were raffled off during the show. The top prize was the brand new black edition Spider-Man that had been used in the tournament; it was won by Keith Nelson. Quite a few game industry celebrities were spotted in crowd during the show beyond speakers Steve Wiebe and Steve Ritchie, including Internet Pinball Database editor Jay Stafford, pinball historian and author Gary Flower, former Williams, Data East and Sega sound designer Brian Schmidt, and Galaga world high score holder Andrew Laidlaw. 2009’s Northwest Pinball and Gameroom Show promises to be even bigger and better than this year’s event, stay tuned to nwpinballshow.com for all the details, as well as photos and more coverage of this year’s show.